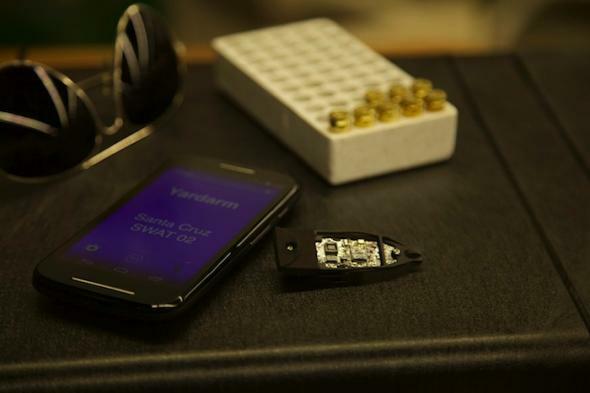 Yardarm gun-sensor technology could help hold cops accountable for shootings. The Yardarm sensor, which attaches to a gun, sits on a table. But other technologies could further help level the playing field. Perhaps the most exciting is the Yardarm sensor, which is a chip that can be inserted into the handle of a gun to deliver data about when a firearm is outside of its holster, when it’s fired, what direction it is pointing, and where it is located. It connects to an officer’s phone via Bluetooth, with an accompanying app, and encrypted data is sent to the company’s servers and the police department. Reliable information about when, where, and how many times a gun was fired could make a big difference in a case like Darren Wilson’s. The sensor was announced this year, and while no price has been officially set, according to a profile on AngelList, it may cost about $100 for the hardware and $10 per month for the data services. Though we’ve known about the product for months, it won’t be available until mid-2015. 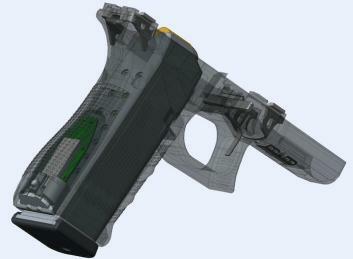 You can put the sensor on any gun it fits into, like a Glock, but gun owners haven’t jumped at the idea of purchasing the sensor. Many of them are already worried about government regulation of guns via technology—just look at the fight over smart guns that would fire only for a registered owner. Sensors may not be standard on all firearms in the United States any time soon, but having police use them seems much less controversial. “The system is rigged in favor of police officers,” Adam Winkler, a law professor at UCLA, told me. He said grand jury proceedings like Wilson’s are not like a normal trial with people arguing both sides. Prosecutors are typically close with the local police force. “They’re part of the same team,” he said. Prosecutors’ cases are brought to them by police forces, and this results in a scenario where prosecutors are often not eager to convict an officer. That may be one reason why it seems that grand juries are less likely to bring charges against a cop involved with a shooting. Sensors could help fight bias in favor of police officers, by providing reliable data about chaotic situations with conflicting witness reports. This is not to say that police body cameras aren’t useful. One study that took place in Rialto, California, found police conduct complaints were reduced by 87.5 percent when body cameras were used. If sensors work as well as advertised, it seems like they would be a natural complement to body cams. Studies of how the Yardarm gun sensor affects police conduct are currently taking place with the Sheriff’s Department in Santa Cruz County, California, and the police department of Carrollton, Texas, and it’s very possible they’ll also find beneficial results. We do have to be careful, though, because people’s trust of technology that they don’t necessarily understand—or that doesn’t live up to hype—can be dangerous. “The evidence from technology can be very persuasive, but it’s not always as accurate as it is persuasive. We know this going back to the days of fingerprinting, which [was] thought to be so reliable,” said Winkler. But fingerprints, and genetic testing, aren’t always as accurate as you might think. “There’s always a danger—especially if people put too much faith in technology and treat sensor data as the word of god,” Jay Stanley, a senior policy analyst with the ACLU’s Speech, Privacy and Technology Project, told me. We want to have as much evidence as possible that can properly convict or acquit an officer, but we have to make sure it’s technology that actually works. “We don’t want to see injustice perpetrated against either police abuse victims or police officers because some sensor went haywire,” he said.